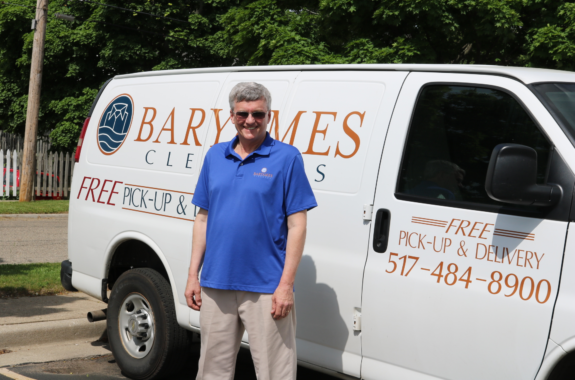 Schedule a Pickup - It's Easy With Baryames Cleaners! Our van comes right to your door twice a week. It’s convenient and it’s Free! We’ll pick up and deliver to your front door whether you’re at home or not. We’re in the area twice a week and there’s no obligation to have cleaning for us at every visit. Your credit card will be charged after your order is processed and prior to delivery. You will receive 2 personalized valet bags for your exclusive use. Simply fill your bag(s) and place your out-going order on your front porch by 8:00 AM. We’ll check for your orders twice a week. Your professionally cleaned and pressed order will be returned on your next service day. This service is designed for your convenience. No strings. No obligations. But we are always there when you need us. Your credit card is conveniently billed at the time of delivery. After you submit your pickup request Baryames will let you know what pickup and delivery route you are on and when to put your garments out for pickup.